[0:00] <maicod> GenteelBen: what do you mean with Latin? [0:00] <GenteelBen> maicod: modern video editing is rarely done on CPU cores. The bulk of the processing is handled by integrated circuits whose only job is to encode/decode media streams. [0:01] <GenteelBen> GPU processing sometimes gives you worse results but you get a 20x or whatever speedup. [0:01] <GenteelBen> ali1234: ah, of course. [0:01] <GenteelBen> ali1234: how outrageous. [0:01] <GenteelBen> We need a new format. [0:02] <GenteelBen> Something with frame seeking, and hookers. [0:02] <GenteelBen> ali1234: duh. The priority is ease of playback not ease of publishing. [0:02] <GenteelBen> ali1234: I can't stream uncompressed video over the internets. [0:02] <GenteelBen> Not if it's 4K HDR 10-bit streams. [0:03] <GenteelBen> Hmm I wonder what the render farms look like for studios like Pixar. [0:03] <GenteelBen> I would assume GPU encoding but with a custom firmware / driver for that stuff? [0:04] <maicod> a different question. I used vlcplayer with openmax IL hardware acceleration out of the box on Ubuntu Mate for the Rpi3 but the vlcplayer in Raspbian doesn't have that decoder. Is it not precompiled for Rasbian ? [0:06] <iOS5stillsigYAY> does anyone use Riscos on their pi? [0:07] <maicod> I only know of TBOplayer to play hardware accelerated video on the Pi3. [0:13] <iOS5stillsigYAY> teclo-: what does rf mean? [0:17] <iOS5stillsigYAY> mfa298: nice you are into Riscos then? [0:22] <iOS5stillsigYAY> mfa298: I use riscos a lot lol! [0:28] <binaryhermit> didn't Acorn invent the ARM architecture? [1:00] <binaryhermit> does Acorn still control the ARM architecture? [1:01] <binaryhermit> In 1990, Acorn spun off the design team into a new company named Advanced RISC Machines Ltd., which became ARM Ltd when its parent company, ARM Holdings plc, floated on the London Stock Exchange and NASDAQ in 1998. [1:26] <charlieray> ShorTie, it worked. [1:28] <I2c> I am using an MCP23008 IO Expander. The problem is that the i2c bus is extremely slow so the connection keeps timing out with the IC and the pi 2 model b. How can I fix this? [4:01] <Viper168> so is there anything cheap and pi-like that can run win 7+ ? [4:05] <irc2000> so the tinkerboard has a documented GPU while rpi doesn't. Game over? [4:11] <ali1234> how is that open firmware going? [4:18] <ali1234> isn't it the same allwinner + mali that is in every pi clone? [8:33] <Travis> I am in the command line on my Pi3. Is there a way to make the screen go blank, like a screen saver? I don't want it on, while running as a bouncer. I have a 7" screen attached to my Pi3. [8:45] <Travis> I am loving using my latest Pi3 as a bouncer, with the 7" screen. [8:48] <Drzacek> should the screen go off by itself after ~5 minutes by default? [8:49] <nevodka> it's probably configured to something like that on default..
[8:50] <Travis> I have forgotten how to make xscreensaver work. This is a first on my Pi. [9:14] <Travis> A feature I love about the Pi3, is that I can use the wireless in the command line. I didn't know I could do that. [10:14] <swensson> isn't it possible to have my "pi" user own the file and let everyone run the file? [10:16] <mfa298> swensson: by default apache and php will potentially have various security measures to try and protect the system. You may have to work around those. [10:29] <binaryhermit> is django... unchained? [11:24] <swensson> ... it's a group? [11:24] <swensson> ... But the www-data is a user, isn't "it"? [11:25] <shiftplusone> except it asks for a password, so I used sudo. [11:26] <shiftplusone> What was the error when you couldnt? [11:27] <password4> sudo su worked? [11:29] <shiftplusone> if www-data doesn't have a password set, you won't be able to use it without being roo. [12:20] <Smeef> What are some other games on the level of MineCraft Pi Edition that can run well on the Pi Zero? [13:12] <swensson> Hey guys, only 1 of my 4 motors are working 100%, when I give full throttle 3 of the 4 motors don't give full power... What can cause this? :O Callibration? What option is that? [13:14] <brainzap> do you have enough power? [13:23] <mfa298> that's more about wire size rather than how good your connections are. [13:52] <Ad0> how can I list out all the available GPIOs? [14:25] <Capo_di_capo> anybody here got experience with gsm800 shield ? [14:49] <Ad0> when you use the gpio command it's the wpi pin # or is it the BCM ? [14:49] <Ad0> like, is it 3 or 9 ? [14:57] <Ad0> yeah but which numbering to use? [14:57] <gordonDrogon> the output of the gpio readall command gives all 3 numbering schemes. [14:58] <gordonDrogon> use the numbering scheme you are happy with. [14:58] <gordonDrogon> wiringPi uses wiringPi numbers by default, but will use bcm_gpio numbers with the -g flag to the gpio command, or if you use wiringPiSetupGpio() in your code, or you can use physical pin numbers with the -1 flag to the gpio command, or with wiringPiSetupPhys() in your code. [14:59] <gordonDrogon> so by default, no -1, -z or -g flags it will use wiringPi pin numbers. [14:59] <Ad0> is the default wpi ? [15:00] <gordonDrogon> so the I2C pins are bcm_gpio 2 and 3. or iwringPi 8 and 9. [15:00] <gordonDrogon> if you change the mode then I2C will stop working. [15:00] <Ad0> or do I have to explicitly disable it? [15:01] <gordonDrogon> you should do, but ..
[15:01] <gordonDrogon> what's your ADC ? [15:01] <gordonDrogon> ok - how is it communicating back to the Pi? [15:01] <gordonDrogon> on the usual serial pins? [15:02] <gordonDrogon> the Pi's I2C pins should not be affecting it then. [15:03] <gordonDrogon> sure, but why did you connect it in the first place? [15:03] <ali1234> yes, what is it connected to? [15:03] <gordonDrogon> the mode will be ALT0 if it's in I2C mode, or IN or OUT. It can never be blank. [15:04] <gordonDrogon> both IN in that image. [15:05] <gordonDrogon> Ad0, back to: what's it physically connected to? [15:05] <gordonDrogon> ie. why are you bothering with it at all if the attiny is talking serial to the Pi? [15:05] <gordonDrogon> you do know the Pi's I2C pins have an on-board 1K8 pullup to 3.3v, don't you? [15:07] <gordonDrogon> that's ..somewhat interesting. [15:07] <gordonDrogon> the avr programmer would normally be connected to an SPI port. [15:08] <gordonDrogon> sure - I know, I wrote code for it. [15:09] <gordonDrogon> but you're using the I2C pin - which has an on-board 1K8 pull-up to 3.3v. [15:10] <gordonDrogon> then you can use the MOSI pin for programming, and the SCK pin for the clock from the Pi to the attiny. [15:11] <gordonDrogon> do you have a proper schematic - not some animated simulation thing? [15:13] <Ad0> can you read .fzz files? [15:13] <ali1234> how can it be that circuit x 3 then? [15:15] <Ad0> can you read fzz files? [15:15] <gordonDrogon> that would be out of family friendly luck then? [15:16] <ali1234> you are using 4 pin attiny? [15:16] <gordonDrogon> I use fritzing, however right now I need to get back to my kitchen - I have 2 dozen pastys to make up. [15:16] <ali1234> given that it only has 6 GPIO, how are oyu going to connect 3 analog signals and also SPI and serial? 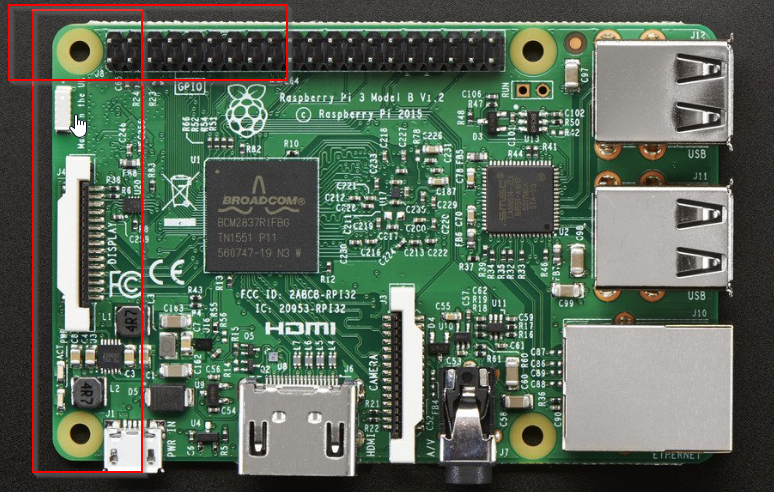 [15:23] <ali1234> what pin is PB0 connected to on the pi? [15:25] <ali1234> to PB0 is connected to raspberry pi pin 4? [15:25] <ali1234> okay what about PB1? [15:26] <ali1234> okay and PB2? [15:27] <ali1234> considering that you do not use i2c at all, why did you choose those pins? [15:27] <ali1234> why not 14/15/18/23? [15:28] <ali1234> what do you mean "near" the UART? [15:31] <Ad0> you mean combine the UART with avrdude programming as well? [15:32] <Ad0> not if I can combine them! [15:33] <ali1234> what is PB0 connected to? [15:34] <ali1234> okay what about PB1? [15:34] <ali1234> and what else? [15:37] <ali1234> just analog right? [15:37] <ali1234> okay and PB5? [15:38] <Ad0> I connected that to all pins to be sure I got enough voltage! [15:40] <Ad0> any special circuitry in there like the I2C? [15:40] <Ad0> thanks for your help so far. [15:43] <Ad0> I should clarify what I mean by "front"
[15:45] <Capo_di_capo> i have a pi zero w but dont have a soldering iron can i just ducktape the io pins and will they work ? [15:45] <Ad0> ali1234: does the SPI have circuitry that pulls it up to 3.3 V ? [16:16] <mozak> .net core nobody? [16:53] <Tenkawa> Anyone having fun with the zero-w's yet? [17:01] <foozb12> Question: http://www.canakit.com/raspberry-pi-zero.html I'm thinking about buying something like (basic kit). The one with the power supply + 8gb microsd. The idea is to hook it up to ethernet and forget about it. Need something to SSH into and edit stuff with emacs. So questions: Are we able to do a headless setup via SSH? And is there anything funky I need to know about installing the java jdk on it? [17:07] <Tenkawa> dont like physical wires getting in my way.. and lets just say the area i work in has "obstacles""
[17:55] <leftyfb> local Microcenter finally got pi0w's in stock this morning. Within an hour I find out someone reserved them all even though in the same conversation I was told it's against their policy to reserve a new product with low stock numbers. [17:57] <leftyfb> does anyone know why the pi foundation has only chosen 1 brick and mortar store with 26 locations in the entire country(U.S.) and won't sell them to anyone else? [18:03] <leftyfb> even the bundles? [18:12] <leftyfb> they also had 10+ of the 0 1.3's in stock this morning. They're all gone as well. They opened 2 hours ago. [18:19] <gordonDrogon> leftyfb, what country are you in? [18:20] <gordonDrogon> and they have stock now, but that won't help you. [18:20] <gordonDrogon> if you were uk or europe I'd suggest contacting them. [18:21] <gordonDrogon> I have 2... and a small number of original zeros I should probably get rid of. [18:21] <Capo_di_capo> anybody here experience with raspberry pi with sim800 board? [18:22] <leftyfb> gordonDrogon: I contacted pimoroni: "I'm afraid we can't make any exceptions to the one Pi Zero per order rule. We're also not able to combine shipping as this is essentially the same thing." [18:25] <Tenkawa> theres some "possibilities"
[19:16] <LordThumper> How do you guys power your RPi3? [19:48] <IT_Sean> bedah: are you measuring that output under load? [20:07] <bedah> http://imgur.com/gallery/RhGwf my power supplies so far..
[20:17] <ShorTie> does it have 24awg printed on it ?? [20:20] <mozak> anyone runing net core on rip? [21:01] <Ad0> gordonDrogon: can gpio command set ALT0 ? [21:22] <noraatepernos> these changes in power source as I switch between. Is that possible? [21:23] <lopta> When the car is running it's likely to be closer to 14V than 12. [21:23] <noraatepernos> ali1234: I figured. It seemed like a challenge. [21:34] <ali1234> what is the point though? [21:35] <ali1234> why learn two operating systems? [21:41] <lopta> TOS Vs. AmigaDOS! [21:44] <clever> ali1234: and dont forget about licensing! [21:45] <shauno> I had a simple mess today. IE supports clauses in comments, like [if IE lt 9]. and IE11 is forcing itself into IE8-compatibility on intranet sites. IE8 compatibility does not honor [if IE lt 9]. So it'll emulate 8's bugs, but not their fixes. [21:47] <lopta> I have used RiscOS in the past though. [21:48] <lopta> ...about a thousand years ago. [21:49] <ali1234> how else would they sell you the upgrade? [21:51] <Ad0> what editor do you use for code on linux then ali1234 ? [21:54] <ali1234> is all this stuff released? [21:56] <ali1234> why not just fix it upstream? [21:57] <ali1234> does it actually happen though? [21:58] <ali1234> why are there ssh keys in your repo? [22:05] <lopta> What is nixos? [22:05] <ali1234> clever: is there a list of packages available? [22:08] <ali1234> what if it doesn't have a new enough package? i get the .nix and bump versions? [22:10] <clever> ali1234: what do you need to customize? [22:11] <hmoney> what are you using this for? [22:11] <ali1234> hmoney: what are we using what for? [22:12] <hmoney> what are you customizing those for? [22:12] * lopta resists the urge to nap. [22:13] <hmoney> for production or to toy with at home? [22:14] <ali1234> did anyone see that nintendo switch display with broken raspberry pi video player on reddit? [22:16] * lopta slumps across his desk. [22:17] <clever> and i was able to switch it back to r/w manualy with "mount / -o remount,rw"
[22:19] <hmoney> couldnt this be solved with a UPS and safe shutdown setup once it noticed power wasnt being supplied? [22:19] <hmoney> or using a cm3 with flash storage instead? [22:22] <ali1234> when was the switch released? [22:22] <hmoney> a week ago? less? [22:23] <lopta> ali1234: Do they have Atari 2600? [22:26] <lopta> It's hard to beat DVD players for price ...but not for reliability. [22:29] <oq> anyone here use the gpio hammer headers? [22:31] <lopta> I used to have technical knowledge. [22:32] <lopta> ali1234: How did you use your spare time? [22:34] <lopta> ...so when the battery dies it's all FF or 00. [22:35] <noraatepernos> I’m having trouble figuring out which processor is in the pi b+. [22:38] <lopta> I would like a B+ at some point. [22:39] <lopta> hmoney: I'm a bit strapped for cash. [22:39] <lopta> hmoney: I'm saving up for a passport and some shoes. [22:41] <lopta> Do the A+ and B+ both have 512M RAM? [22:41] <lopta> Ah, found it. [22:42] <lopta> The new ones have 512M RAM. [22:44] <lopta> A+ has the camera connector, right? [23:42] <Travis> I am about through with my 7" screen. I have major issues using it. If Raspbian or Ubuntu MATE can be configured to work more like a tablet, then it might be ok.
[23:47] <Smeef> Travis: Which model 7" screen? [23:49] <Smeef> I've been able to configure a 5" resistive touch screen I got off eBay to work like a tablet. That is, portrait mode, with hold down stylus to right click, digitizer calibration, etc. [23:50] <Travis> I hate the fact, that most of the bottom of the screen isn't usable. [23:50] <Travis> I can't see it. [23:51] <Travis> For now, I removed it and put it in a traditional Pi3 case. [23:52] <Travis> That reminds me. My IRC bouncer is a Pi3 with zero heat sinks. It didn't come with any. [23:53] <Travis> I can run the internet connection via the wireless, instead of a wired connection. [23:53] <Travis> It's going great now. I am on it. [23:54] <Zardoz> think you need 80c before it starts to throttle. [23:55] <Travis> brb. Getting the phone from the car. [23:57] <Smeef> BTW, on an unrelated note, anyone know any good non-emulated games, on the same quality level as MineCraft Pi Edition, that I can install and run on a small 320x240 display?